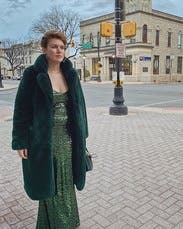 Bundle up in this glam faux fur coat from Apparis. 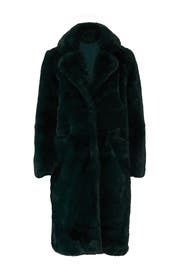 Green faux fur (80% Acrylic, 20% Polyester). Coat. Long sleeves. Hidden snap button closure. Fully lined. 43" from shoulder to hemline. Imported. I will admit when I first tried this on it felt bulky and swore I looked ridiculous- but then I got so many compliments on it! I agree with all the previous reviews, the buttons are useless but it is very warm and a fun holiday statement. Try it for fun it's like living in a fluffy heaven. coziest most beautiful and soft jacket of all time. This coat is so beautiful and soft, just runs small, I had to send back and size up. Receivers many compliments! Such a pretty and cozy coat! Makes you feel glam! I got SO many compliments on this coat. Will definitely rent again. 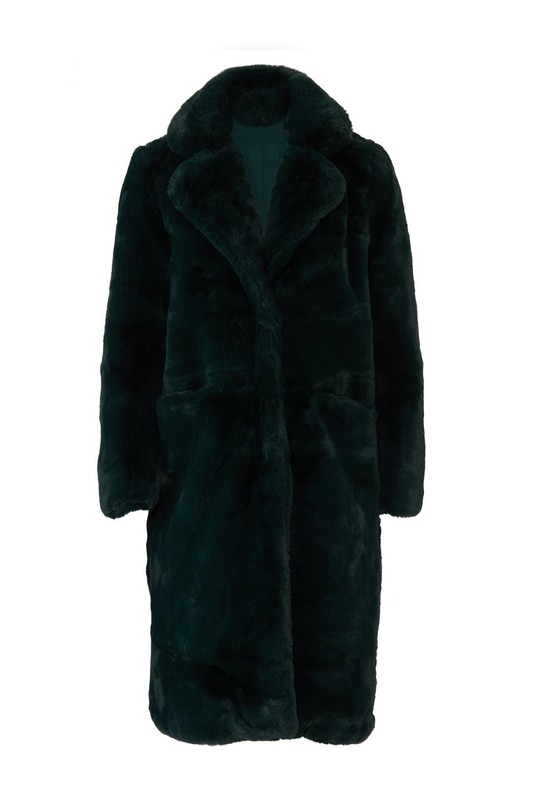 Super fun oversized teddy bear coat in a beautiful shade of dark emerald green. Yes, it has a very oversized feel to it, but very warm and well fitting. Wanted to keep it! 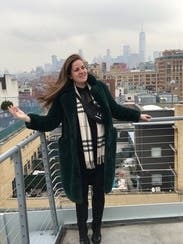 Rocked this puppy in FRIGID New York for three days and it was everything. I was so warm! The color is beautiful and went with everything. 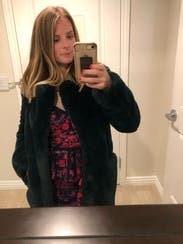 Longer in length, super soft faux fur, and so much fun to wear. Got so many compliments. Great color, soft...but not functional. Lush. Loved the color and softness. However, as another reviewer pointed out, the snaps are useless so the coat doesn't stay closed....not ideal when below freezing. Runs tight in shoulders/arms if bulky sweater under. Shoulders and sleeves didn't fit a sweater underneath. Thick and expensive. Warm. Great color. Tons of compliments. The sleeves and shoulders were so tight I couldn't move when I layered it over a sweater. There are only a couple feeble snaps on the front of this and they don't stay closed. So it is meant for cold weather (super hot) yet won't stay closed to keep out the cold... A fail. 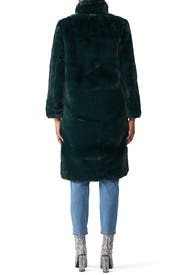 This coat is a playful way to make it through NYC winter. Super warm, only downside is that because it's so heavy and warm the clasps do not stay shut so you can't button up and keep the front closed. I rented this because I thought I would be in Hoboken for work. Turns out that trip got cancelled. 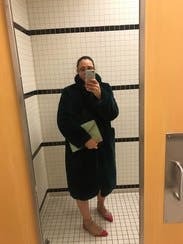 No matter, it was chilly in california and I wore it a few time to work and school drop off. It was SUPER WARM. I have to believe this could hold up in a northeast winter. It has all the weight of a real fur with none of the shame. When asked what it was made of (by a child) I said it was Oscar the Grouch; it is a beautiful deep green shade. I will suddenly be in NY next week so I decided to keep wearing it! Good timing too because it is now 72 degrees in CA. I though this would be fun to take on a trip to NYC with my teenage son. While it was beautiful and super warm...it made me look HUGE! Not for bigger girls...I'm a size 10 and 5'10" and this was just a little too much on me. Really pretty though!! 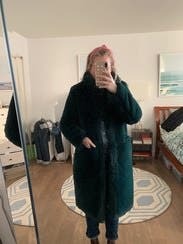 This coat is definitely comically large but I just wanted a big green coat for st. Patty's and this delivered. It was very warm even though I couldn't get the front to stay closed. You'll turn heads in this coat. I don't know if I personally would try dressing it down with jeans but I bet the right person could make it work. Cozy winter coat. Perfect for those below zero days! 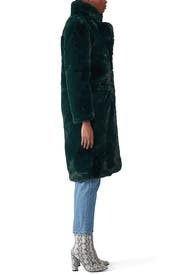 This is an over-sized, fluffy, warm as can be coat. There are two deep pockets in the front! Dark green color is beautiful! I wanted to love this because it felt very plush but on a petite frame like mine, it just makes me look small and stumpy. This coat swallowed me whole. It's really a medium and not a large. Beautiful material/color and well-made but added a ton of bulk and was not flattering at all. The material is so thick and not structured so I was drowning in it, despite it feeling snug. May work on someone super tall and thin but definitely not the average build. I found this style to be incredibly unflattering on me and tight in the shoulders/arms... Didn't wear it, don't plan on renting again and sizing up. A little snug around the hips. Loved this coat, had a spell of warm weather and could not wear it though. it was snug across the shoulders (I am athletic build and have broader shoulders), I'm not sure I could have buttoned it without feeling too snug. I thought it would look more slouchy on, but I'm not a petite frame so that was not fair of me to expect. Great coat, super gorgeous but waaaaaaay small for a medium. Will need a large when it's available again. I feel like it runs small and it is difficult to close the snaps on the front. 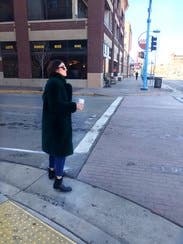 Luckily it wasn't that cold so I was ok. It is very warm! 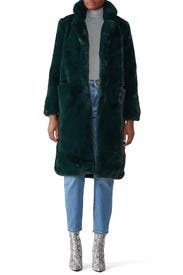 This is the softest faux coat. Everyone kept touching it. It is long, but a super fun piece to wear to a party or girl's night out. 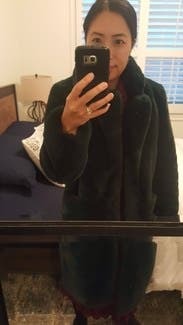 Pros: Beautiful deep green color, the material is super soft and luxurious Cons: There are two snap buttons buried deep within the faux fur. If you manage to snap the buttons, they will immediately unsnap as soon as you move a little bit. Super heavy, cozy, and warm!!! 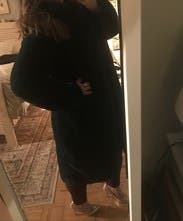 I got size Medium so that I can wear it with sweaters/knits, and it was the perfect size for me. It kept me so warm, and the quality of the faux fur was amazingly soft. The quality is superb! The con is the left pocket liner is torn, so I will have to repair it if I decide to make it a keeper. The color is subtle but enough to stand out in green. LOVE, LOVE, LOVE!!! Amazing in every way possible! No way you could be disappointed. True to size. Get ready for everyone to want to pet you!